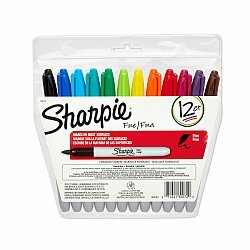 Permanent marker, quick drying, water-resistant ink. Durable storage pouch. Colors: Black, Red, Blue, Green, Yellow, Brown, Orange, Purple, Berry, Turquoise, Aqua & Lime. We offer free shipping on some orders. Click here for details.